Sail with Captain Doug aboard Bay Breeze! Whether you are a “from here” or a “come here” we invite you to go sailing with us! 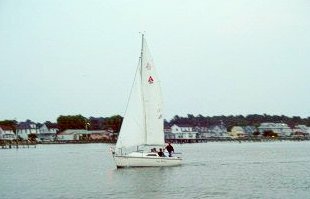 Bay Breeze is a 22′ Capri shoal draft, 9′ cockpit cabin with head, west coast sloop. She is perfect for sailing the waters of Chincoteague and Assateague. View the beauty of Chincoteague and Assateague from a different perspective. While Bay Breeze is under sail the dolphin, sea turtles and waterfowl often stay close aboard for a unique view! Captain Doug holds a USCG Master’s License and is a certified sailing instructor. Optional sailing plans are available. All cruises are private parties! Times and length of sail are flexible.